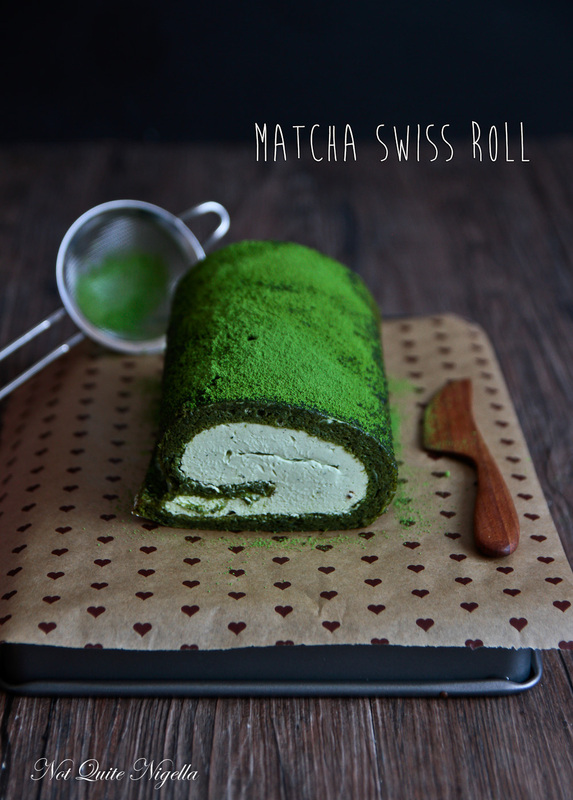 A Most Marvellous Matcha Swiss Roll! What kind of dog you would be if you were a dog. The questions were easy for Mr NQN to answer because perhaps we talk a lot of rubbish, but we frequently have conversations about what dog we would be. His answer is the Great Dane - a large, sweet, gentle giant. For me it would be the Pomeranian. Little, vivacious and sometimes thinks that they're bigger than they are. I asked my friends and family the same question and these were the dogs that they chose along with some of the dog's most defining characteristics. The dogs that everyone chose were so much like the people it was rather spooky. And what is even funnier is that my whole family where I am the tallest at 5 foot 2 inches all chose little dogs. And at a recent Chinese New Year lunch that my cousin Rich hosted, I knew the cake to bring along that would please all of my family and also because it was an all Chinese crowd. 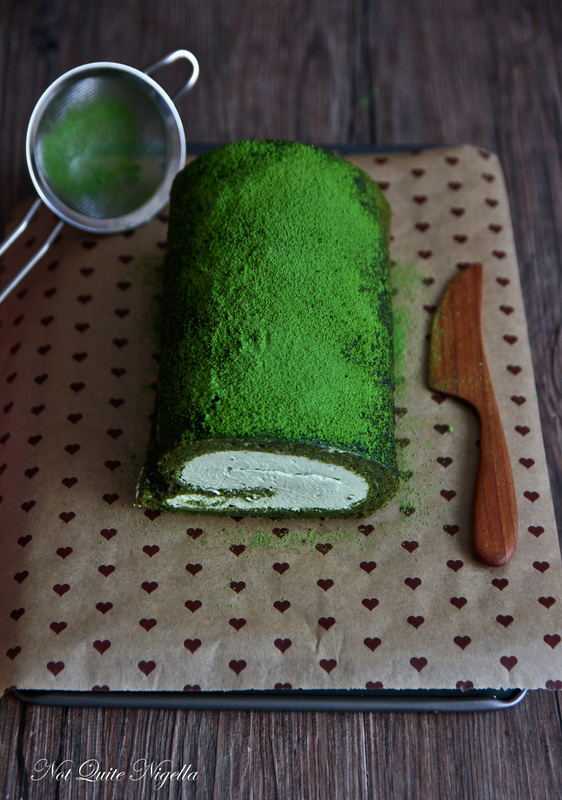 It was this matcha swiss roll. Asian cakes tend to be lighter than Western cakes and tend to feature flavours like black sesame, green tea, red bean, pandan or other Asian dessert flavours. And if you find Swiss rolls on the dry side, I can really, really recommend this Swiss roll. 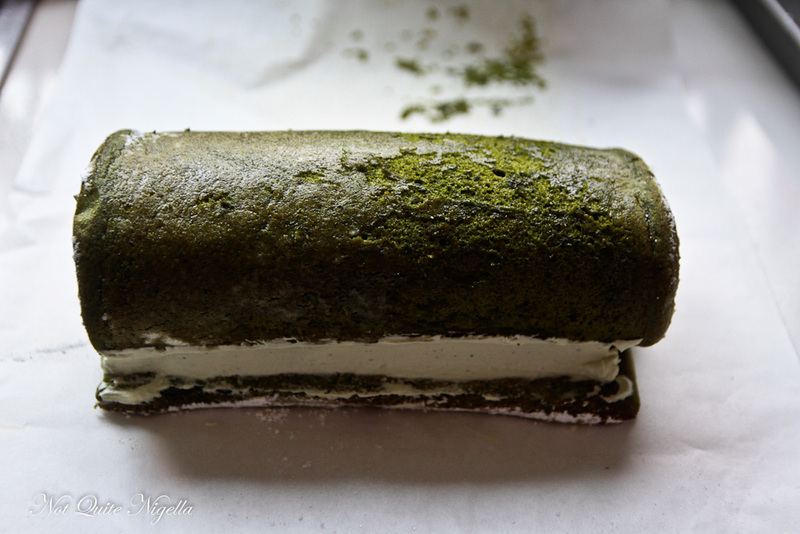 Strong in matcha or green tea powder, the cake itself is not dry, it's moist and soft and it is filled with a matcha and vanilla mascarpone. Kind of like a green tea tiramisu! It's not overly sweet and the texture of this Swiss roll really is something gorgeous to behold. I've made many Swiss rolls trying to get to "the" one and this is the sum of my efforts! And yes if you like Swiss rolls, I urge you to make this beauty! So tell me Dear Reader, what dog would you be and is your choice very much like your personality? And what is your name and your favourite movie? And Happy St Patrick's Day! Step 1 - Preheat oven to 200C/400F. 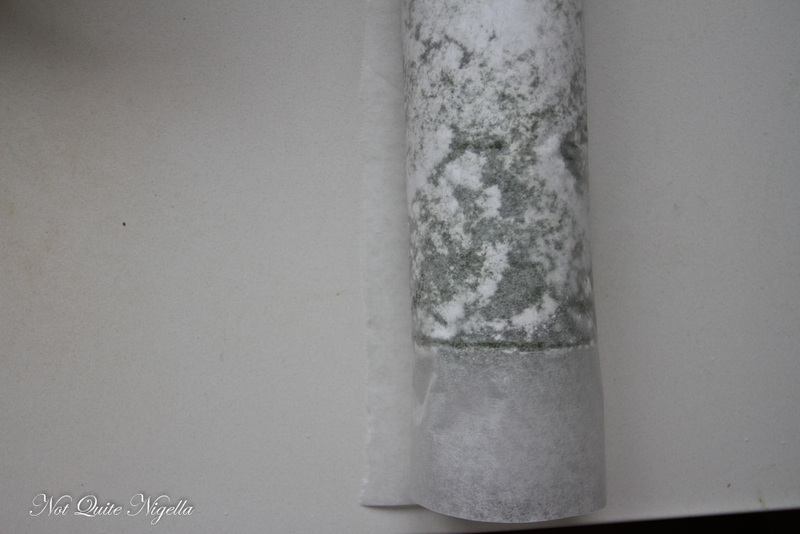 Line a Swiss roll tin with parchment on the base and sides. Whisk egg whites in the bowl of an electric mixer until foamy and then add the sugar gradually until soft peaks form. Add yolks in one at a time while whisking. Sift the flour in at a height and then add the oil and green tea liquid. Fold until incorporated. Step 2 - Spread out into the prepared tin and tap gently against the counter to get rid of any air bubbles. Bake for 10 minutes. Cool for another 10 minutes. Step 3 - Take a large sheet of parchment and sift some icing/powdered sugar over it. Remove the cake from the tin and place top side down on the sugared parchment. 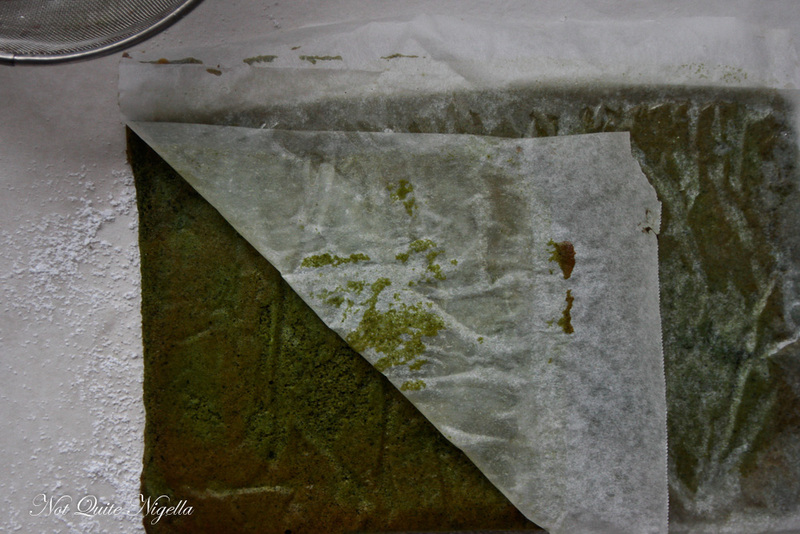 Gently remove the parchment from the back and sides of the cake. Roll up gently and allow to cool. It doesn't take long. Step 4 - While the cake is cooling, make the filling. 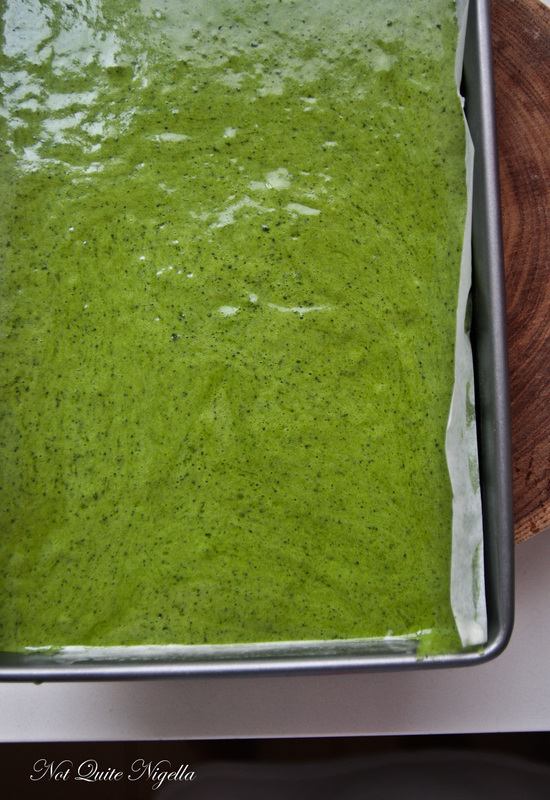 Beat the mascarpone, 1/2 cup of powdered sugar, vanilla and matcha powder together until thick and spreadable. I used a home made mascarpone that wasn't as solid as bought so I ended up whipping it to thicken. Step 5 - Gently unroll the Swiss roll and fill with the mascarpone filling. Roll back up and chill overnight or for a few hours. 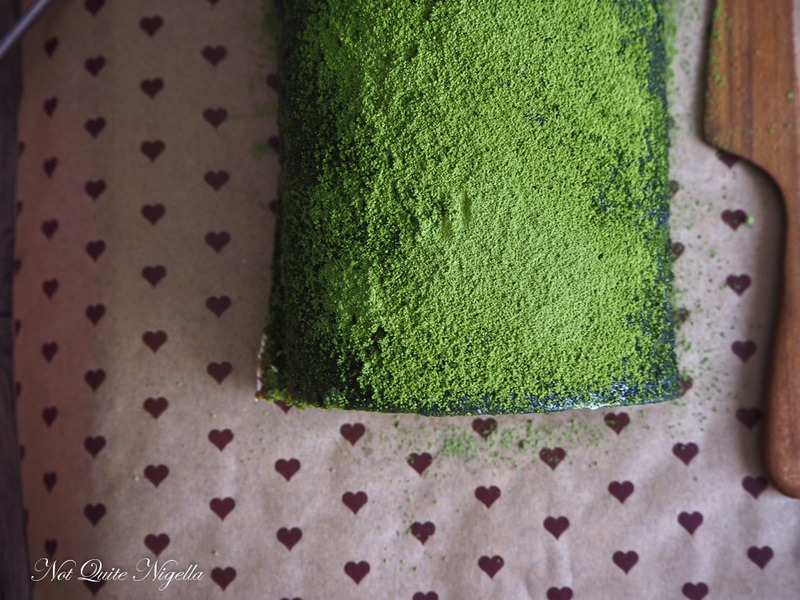 Sift more matcha powder on top and slice off the ends (just to make it look a bit neater-cook's treat! ;)) just before serving. recipeVictoria, the "London Fog" Earl Grey Tea Cake! recipeValentines Day Matcha Pancakes With Hot Chocolate Ganache & Strawberries! 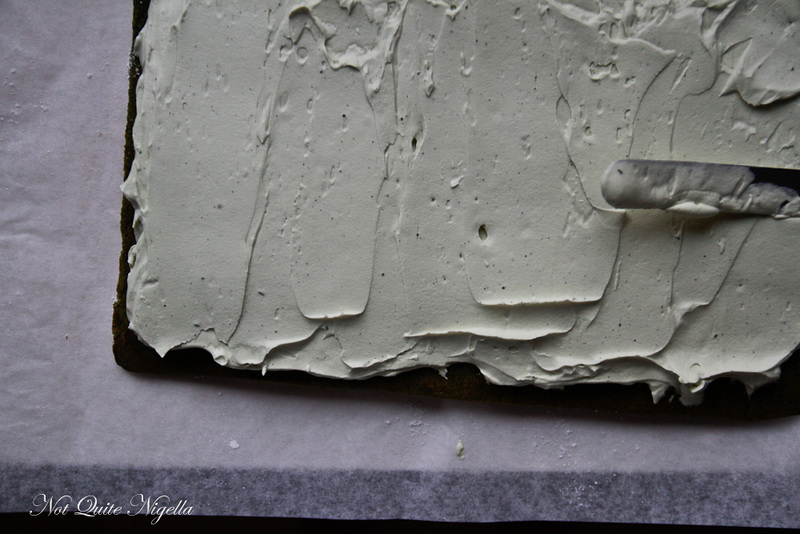 recipeClara, The Eight Times Matcha White Chocolate Lime Cheesecake To Die For! featureCzech Honey Cake (Medovnik) & Some Book News! recipe Victoria, the "London Fog" Earl Grey Tea Cake! recipe Valentines Day Matcha Pancakes With Hot Chocolate Ganache & Strawberries! recipe Clara, The Eight Times Matcha White Chocolate Lime Cheesecake To Die For! feature Czech Honey Cake (Medovnik) & Some Book News!